Do you know what your blood work is telling you about your health that your doctor maybe doesn’t know? Many of us go off to our doctor not knowing which blood tests they may suggest for us or why – but I want to change that. If you aren’t proactive when it comes to your health you simply can’t rely on someone else to be – doctor or not! 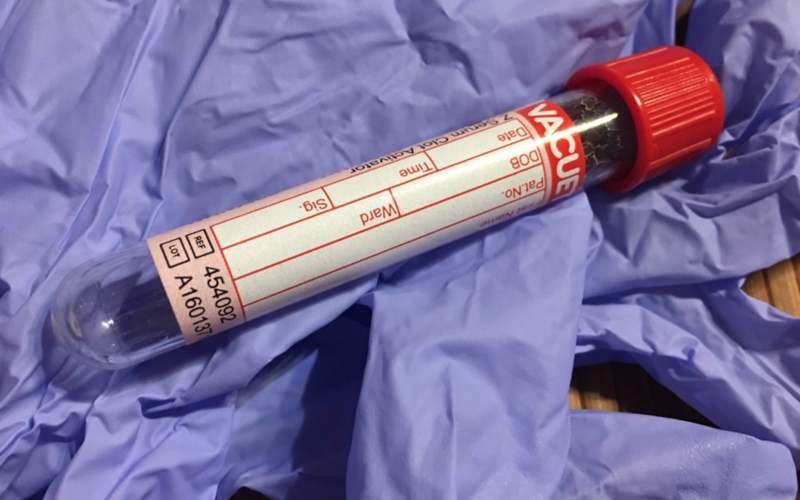 I want to tell you about some some blood markers that can be indicative of things going on in the body beyond simply disease, (which is what your doctor is primarily screening for). You see, there are ways you can use your blood work to catch an issue before it even becomes an issue. And this “preventative care” is something that many doctors simply aren’t trained to do. But before I dive into that I want to first encourage you to always obtain a copy of your blood work results from your doctor whether your doctors says your results are “normal” or not. You have to keep your records ladies! Keep a copy of your blood results (all of them!) in chronological order on your computer and/or in a ring-binder folder. If you’re not doing this then you simply are not being proactive when it comes to your health. Keeping your own blood records allows you the chance to see if there are any markers that are creeping up or down the wrong way over time. And with my blood work cheat sheet that you can download here you can ensure you are always hitting – or striving to hit – the functional optimal ranges. Here’s the thing that doctors won’t tell you: “normal” lab ranges are based on averages that that particular lab has calculated based on the patients that go into that lab to have various tests done. These normal ranges are based on population statistics of people who are “generally healthy” with an absence of disease. But here’s the thing: “absence of disease” does not indicate “optimal health”. In functional nutrition and functional medicine “normal” lab ranges aren’t used. Instead, we look at functional optimal lab ranges. These are lab ranges that indicate low to zero risk for disease and suggest optimal wellness and healthy aging. The lab ranges that I and other functional health practitioners use have been based on clinical trials as well as the clinical experience of prominent functional practitioners. Honestly, some of the “normal” ranges on lab results are ridiculous. Take ferritin for example. On my last blood work the lab range was 5 – 272! And the vitamin B12 range is 138 – 652. That’s nuts! How are we to know where we fall on the spectrum of “close to disease” and “healthy, preventative range” when the ranges are this wide? We simply need to be working with more refined, accurate ranges. High uric acid can sometimes be an indication of a leaky gut or mycotoxins, (yeast or molds), oxidative stress in the body, and more. And when we look at high uric acid in combination with other markers such as high triglycerides, low HDL, high LDL and high platelets it’s a strong marker for atherosclerosis. High creatinine can sometimes indicate an overconsumption of protein or meat, dehydration, urinary tract congestion, and more. When it’s low it can be an indication of muscle atrophy, lack of physical activity, or inadequate dietary protein or impaired digestion, (because if your digestion is impaired you can’t properly absorb your protein). High calcium can indicate hypothyroidism, too much vitamin D supplementation, and poor fat digestion. On the other hand, it could be low, indicating potential low stomach acid, (you need ample stomach acid in order to digest and absorb your minerals), a magnesium and/or vitamin D deficiency, or an intestinal malabsorption issue. Low albumin can indicate low stomach acid, liver dysfunction, oxidative stress in the body, or a vitamin C deficiency. When it’s high it can indicate dehydration. Alkaline phosphatase when low is a very strong marker for zinc deficiency, (because alkaline phosphatase is a zinc-dependent enzyme). On the other hand, if it’s high this can indicate gallbladder issues, liver cell damage, bone loss, leaky gut, and more. When you have high AST this can not only indicate liver dysfunction but also potentially developing congestive heart failure, cardiovascular dysfunction, liver cell damage, and a vitamin E deficiency. It can also indicate viral infections such as EBV, (which can be seen on a GI Map stool test, which all my clients run). High triglycerides don’t just indicate potential metabolic dysfunction and cardiovascular disease but they can also be an indicator of poor metabolism and utilization of fats or an h. pylori infection, (something the GI Map tests for). Whereas low HDL can also indicate a potential h. pylori infection as well as potential metabolic syndrome, fatty liver, atherosclerosis, oxidative stress and even heavy metal toxicity. High eosinophils can indicate intestinal parasites, (the GI Map tests for these too) as well as food and environmental allergies or sensitivities and even asthma. And in some cases high eosinophils can indicate a fungal overgrowth. So as you can see there’s a lot more to blood markers than just the indication of disease. But you need to be working with a health practitioner who can look at your blood chemistry from a functional perspective to give you the best chance of disease prevention. Start early! Get a full blood chemistry analysis run at least once a year. This is something I offer the ladies who are part of my Healthy Mama Hive online health membership at 30% off my regular one-on-one fee. And remember, if you haven’t already, grab yourself a copy of my latest blood work cheat sheet here, (this isn’t my complete guide, that’s only going to be available to members of The Healthy Mama Hive).